Sherice Nivens has fond memories of her time as a student at NC State University. She formed close friendships that she treasures today and learned from faculty who were knowledgeable and truly cared about her success as an individual. Nivens is now a senior thoracic marketing manager for Intuitive Surgical. But without private support, her story might have been very different. I would not have been able to come to NC State without scholarships. And while I was at NC State, if I had not continued to apply for and receive scholarships, I would not have had an opportunity to finish my degree. Nivens earned a bachelor’s degree in chemistry in 1998. She went on to earn a master’s degree at the University of North Carolina at Chapel Hill. Interested in providing the same type of support that made it possible for her to attend NC State, Nivens established the Arnater and Viola Nivens Scholarship Endowment in 2008. It provides scholarships for students in the College of Sciences. The scholarship endowment also allowed Nivens to honor the legacy of the grandparents who raised her. “My grandparents had very little, but they always stressed education,” she said. Kiara Richardson, a senior chemistry major from New York City who also is pursuing a biomanufacturing certificate, was a Nivens Scholarship recipient during the 2015-2016 academic year. To receive a scholarship is like someone saying, ‘I believe in you, and I’m going to give you this money because I trust you to make sure that you’re doing the best you can.’ It was like a reassurance that I was supposed to be here. Beyond financial and moral support, the scholarship gave Richardson the opportunity to meet Nivens and hear some practical advice for working in a male-dominated industry. 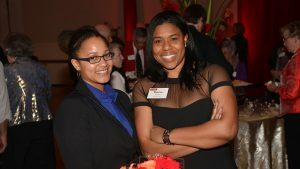 Kiara Richardson (left) poses with Sherice Nivens during the 2015 Celebration of Philanthropy event. “A lot of business is talked about on the golf course. She told me, ‘you need to take golf,’” Richardson said of Nivens. Richardson took heed. Nivens said it was a blessing to share career insights — things she didn’t know as a college student or recent graduate — with Richardson. After she receives her bachelor’s degree in December, Richardson plans to pursue a master’s degree in pharmaceutical science or an MBA. She hopes to one day own her own business specializing in cosmetics and hair products for women of color. Richardson said Nivens has inspired her to give back to NC State and she hopes to create a scholarship for students from underrepresented groups. Richardson also wants to go back to her hometown of the Bronx to start a career-focused program for young girls. Nivens was touched to hear Richardson’s plans to give back — through the university, her church and larger community. Nivens said she expects Richardson to be exceedingly successful. Nivens, who serves on the NC State University Foundation Board and the College of Sciences Advisory Board, said supporting her scholarship endowment and other initiatives at NC State is a priority because she believes in the university’s mission. She also is a member of the Chancellor’s Circle, the College of Sciences Dean’s Circle, the R. Stanhope Pullen Society and the Leonidas Lafayette Polk Society. Nivens said it’s important for alumni to continue to support the university and its students. “It’s our duty to give back in the ways in which we can, whether it’s financially or otherwise,” she said.